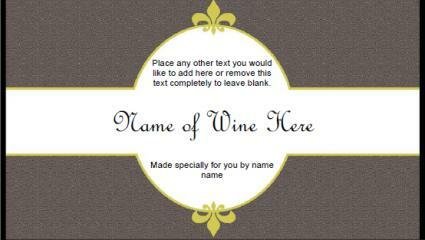 If you like to bottle your own wine, free printable wine labels add a personalized touch to your bottles. Use these labels to celebrate a special occasion like Valentine's Day or Christmas, or just choose a beautiful label that will work any time and use the gift of wine to let someone know you care. 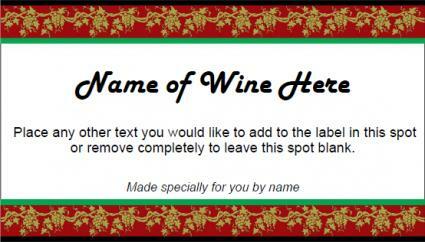 Check out these free printable wine labels that will have you covered for almost any occasion, from every day to the holidays. 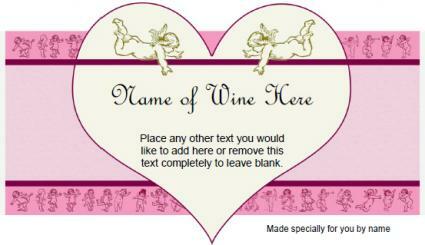 The templates below work with Avery wine labels 15516, 5126, 8126 and may work with other brand labels. Click the images for the printable PDFs. If you need help downloading the labels, check out some helpful tips. Graphics in the free templates cannot be changed. However, you're free to edit the text to suit your needs. If you don't have enough text to fill a spot, simply delete the example text. The space will print blank. Finding great looking wine labels to download on your computer is convenient. However, they still need to be printed out and applied to your wine bottles. There are several ways to accomplish this. 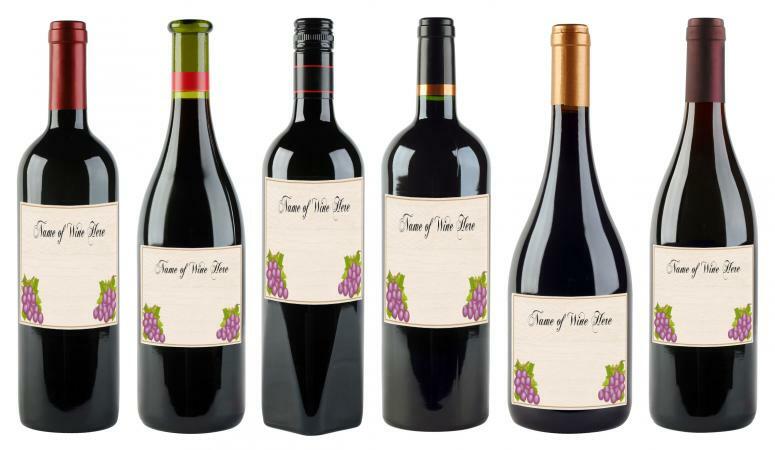 One way to use your free wine labels is to print them directly onto paper, cut them out, and apply them to the bottle. The type of glue you use should be able to withstand a little moisture and not disintegrate if it becomes damp. Good choices include Elmer's glue and rubber cement. Some people have been able to use glue sticks as long as they totally coat the label with the glue before it is applied to the dry bottle. Another option is to purchase pre-gummed labels or adhesive labels. Ones that are manufactured specifically for wine label use will stay adhered to your bottles while others made for general use may come off or slip when they become moist or wet. Often these packages of labels will provide directions on how to use your word processing program to print them out correctly. It may be helpful to print out a copy of your wine labels on plain paper first to ensure correct alignment of the label sheet. Consider the conditions under which your wine bottles will be stored. If the bottles will be in a cool, dry environment the labels will probably stay on without any problems. Bottles stored in a cellar or in areas where they may become damp will need labels with strong sticking power. 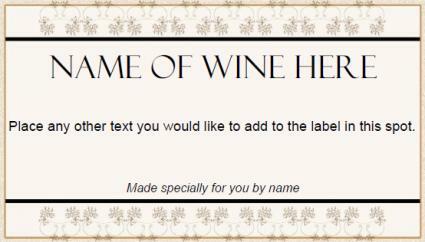 Consider using the labels on wine gift baskets. Wrap the basket with cellophane and then place the label on a smooth spot on the front of the basket. At Christmas, Valentine's Day, or on a birthday, use the labels as a gift tag. Just peel and stick on the wrapped present. 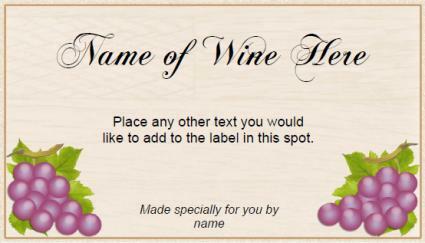 If you're giving out a wine wedding favor or other special occasion party favor, use the wine labels as your favor tag. You may need to attach a small blank tag made from card stock if the favor is too small to fit the tag on neatly. When using the labels on something other than a wine bottle, be sure you adjust your text so it makes sense. Free Label Maker - This site offers software that allows you to make custom wine labels that can be as plain or fancy as you choose. Of special interest is the theme category, which includes celebrations, sports, humor, and more! Magical Kingdom - This site has three different grape designs and six Christmas designs for wine labels. These labels feature photos, so for the best quality use a laser printer. Labeljoy - Pick from one of five neat wine labels that range from having room to describe the wine to options featuring corks. They are classy and professional with room for a company logo (or personal photo). Canva - Start designing a wine bottle label using this free program. You'll need to sign up for a free account, but after that, you can customize graphics, fonts, and more. There are a few designs that do cost, however, so be sure you're selecting the free options. Printing your own wine labels is a great way to make your wine bottle as unique as your homemade vintage. It is also a good way to save money on labels when you are making small batches of wine and mead. Another bonus is that many of these labels are customizable so you can change the printed information and graphics easily. 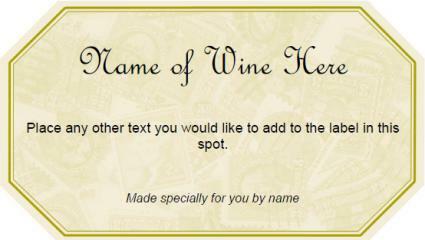 Why not try some of these labels on your next batch of wine? You'll save money and have a great looking bottle of wine, too!